Low speed and full load startup; stable running by tension control when increasing and decreasing speed , noise is decreased. High dots presentation rate under high speed; clear and vivid stratification of screen printing; strong stereo effect and accurate registering. Aluminum roller adopts the Japan semi-sealing small bearing; flinty oxidation, static and dynamic balancing treatments are conducted; low resistance and small flop. The special made modulus angular gears adopted; accurate printing size and full printing specifications (5mm is a spec). With the air exhaust, blowing and heating settings; the heating system adopts the central thermostatic control system and group management, also with the cold air forming devices. Printing rolls should keep moving while machine halted. Material holder use air shaft. Unwind with auto deviation correction system (EPC). 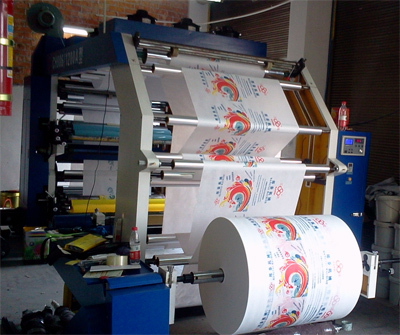 Reversible printing 4 color press for 4+0, 1+3, 2+2, 1 set of printing cylinder, sizes: 15 inches.